Millions of people the National Dog Show on NBC on Thanksgiving Day and rooted for favorite breeds as they competed in one of the most prestigious dog shows in the country. One Chester County family experienced the excitement first-hand as their beloved Chesapeake Bay Retriever competed in the Sporting Group. Doots (full name GCHB CH Chesabar's Mr. Doots Mason CD BN RE) is owned by the Matthias Family of Cochranville. Eight years ago, Bev and Jeff Matthias took their teenage son, Wesley, to Chesabar Kennels in Bridgeton, N.J. to meet an eight-week-old puppy. The curly little brown puppy belonged to Wesley by the end of the night. Bev tried to let her husband and son do most of the rearing, but it wasn't long before a strong bond formed between Doots and Bev. Doots is owned by a Cochranville family. Since then, there have been big accomplishments in the show ring, including Best of Winners at the 2009 American Chesapeake Club National Specialty, and a Reserve Best In Show honor in 2015. Best of Breed at The Kennel Club of Philadelphia's National Dog Show was one benchmark that eluded them until this year. At the Nov. 19 show, AKC judge Linda Robey examined the confirmation, movement, and coat of each of the 53 Chesapeake Bay Retrievers entered, and awarded Doots "Best of Breed." She took show handling classes with Doots to learn the basics of showing a dog in an AKC conformation event. Then they attended their first dog show. They received encouragement from their breeder, judges, and fellow exhibitors, and they were quickly hooked on the sport dog shows. Each of the 189 breeds at the show were examined, until every breed had a Best of Breed winner. Breed winners then competed against each other in the Terrier, Herding, Hound, Toy, Non-Sporting, Sporting, and Working groups. 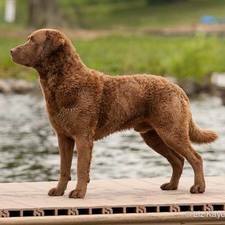 The Chesapeake Bay Retriever, part of the Sporting Group, had 32 breeds represented and competing for one of the top four awards. AKC judge Joseph Gregory made his first three Sporting Group picks, then with a smile directed at owner/handler Beverly Matthias, he made his fourth place selection -- the Chesapeake Bay Retriever. To receive a group placement at a prestigious show like the National Dog Show, with an entry of 1,805 dogs, meant that Doots was judged among the top 28 dogs at the show. In the past four years, Doots has sired many litters, and his puppies have found homes throughout the country. One of Doots' two year old sons, Dyson, was also competing at the National Dog Show with Bev on the lead. He took the "Best of Winners" award that day. This award is given to the top dog in each breed who is not a champion yet. Bev and Doots will attend a couple more shows in the tri-state area in the next month or two, then they are planning on attending Westminster in February. Bev would also like to add another obedience title to the end of Doots' name in 2017.